Maurine Goodrich, the department manager over chick sales at IFA for 12 years holds a Blue Laced Red Wyandotte chick. Goodrich said chicks sales have been brisk this year especially on Saturdays. It’s chick season in Cache Valley and farm stores have their baby chicks in and the little peepers are selling at a good rate. 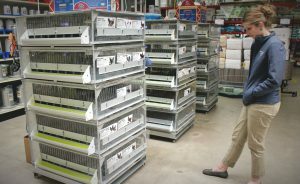 Rebecca Leonard, an FFA advisor from Ridgeline High School, looks over the inventory of chicks at the IFA store in Logan. The IFA stores cut their beaks on poultry. Originally the company was called Utah Poultry Producers and they were among the first in the country to market milk white eggs. At IFA chicks are not just a springtime thing. Besides the spring sale beginning in late February, they also have a new batch in July and August, and then some fall birds in September. “Some people think they are saving money on eggs by raising their own chickens in their backyard, but in reality you have to have more than a few chickens to beat the store prices by the time you pay for the feed,” Schuman said. Schumann said it was good for his children to have chickens. It teaches them responsibility. He said most people who raise chickens like their eggs better than store-bought eggs. Maurine Goodrich, the department manager over chick sales at IFA for 12 years, said they usually sell a lot of chicks on Saturdays. Chicks feeding at a local farm store ready for adoption. Chickens are crossing over from livestock to pets. There are collars available for walking chickens and all sorts of treats to give them. Goodrich said right now they are just selling chicks, but in a week or two she will bring in the ducks and turkeys. She also special orders Guinea Birds for people. They have chickens that lay brown eggs, some that lay dark brown eggs, blue eggs and white eggs. There are pictures on most of the cages to show what the chick will look like grown and the color of the egg it lays. When buying chicks, the older the chicken, the better chance of survival even though the younger ones are cuter to look at. When a chick is purchased, customers are handed a lot of printed material to help them be successful at their livestock venture. There is information on how much feed and water the chicks need, as well as the correct temperature to keep the young birds alive. 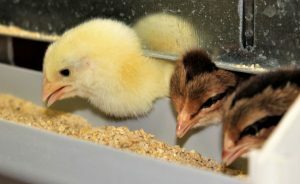 Besides IFA, the other major supplier of chicks in the valley are Tractor Supply at 78 South Hwy 165 in Providence, and Cal Ranch at 1300 North Main in the Cache Valley Mall. 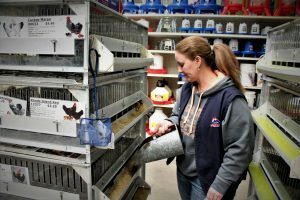 In Preston, Idaho chicks can be found at Valley Wide Cooperative located at 265 South State and Bomgaars, 38o E. 600 S.
Maurine Goodrich feeds the chicks at IFA recently. Farm stores across the valley have a good variety of young poultry ready for adoption. “Below are five necessary things would-be chicken owners should know and do,” he said. Plan out where and how the chicks and adult chickens are going to be cared for. Have all waterers and feeders in place before bringing chicks home.